Hello you Guys, I am working on a motor conversion. A 1.6 AEE engine in my RHD polo MK1. it is the only RHD polo in the Netherlands. There is no brake booster in the polo. I would like to build in 1. I think there is too little space to build in a brake booster. Are there any members who have built a 1.6 (16V) engine in a 86(c) in combination with a brake booster. or I just do not have to whine and kick harder on the pedal. the last option is to convert the polo to LHD. 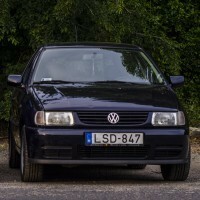 Although I would find it a shame, it is still quite unique a RHD polo in the Netherlands. Hello everybody! I swapped my 1.0 AER engine to a 1.6 16V AVY, replaced the engine loom, the ecu, the chip in my keys, and the little receiver around the ignition barrel, (and a lot of other stuff, like pedal box, etc) but I couldn't replace the immo box, because my loom has 6 cables, and the donor car's box has 8. (I have a 98 model, so I have the later wiring) Is there a way to connect the new immo to the car without a professional? Or what should I do? Thank you in advance! Originally I joined as I got a 1.4 16v coupe 6n2 as a backup car. I have a 3.0tdi A6 that I like to tinker with a lot, and still have a ton of electrical issues with it, the most significant being related to a manual to automatic transmission swap... so I do tend to keep it at a shop a lot. Also it did proove not much practical for a daily use. But as my mother’s 6n2 gave birth to all of its fluids, I decided to give her mine and get something better, as I was already looking at a possible engine swap for the 1.4... As a result I got a pretty sweet GTI. I did’t expect much. Got it from a dealer, which was already a bad omen , but the car was in a surprisingly good visual condition. It hasn’t been driven since at least an year (January 2017) with less then 7000km done in 2016. I got it on 138 000km, and its last history is from Switzerland from 2013 at 118 000km. It is kinda believable that it could have done only 20 000km in 2014 and 2015, but here rewinding the milage is still very much a thing. Still it looks like being close to that arlt least. The car had its gearbox repaired while at the dealer. Everything else was in order. Of course for the first several days there were no brakes , until the calipers remembered how to work. I got it from another city, so it wasn’t the smartest idea to bring it home directly after sitting for so long, but it performed flawlessly. Of course by Murphy’s law, exactly on the next day, I got the ABS lamp on, and a bit after that the Engine check on also. Thse were because of a rear light speed sensor and a misfire in cilinder 1. Alongside the standart service, I changed the spark plugs, the spark leads and the spark coil and the speed sensor. But still occasionally (I think when I sit in traffic) it does log a misfire, which I can’t even register. Will do a compression check next year before installing the LPG system, as nothing else looks suspicious. The only other issue it had was that the left window didn’t work, while from the driver’s door I could only open the passenger’s windows with both positions of the switch. Also the central locking button on the door could lock the car but couldn’t unlock it. Today I repaired it by fixing a cut wire between the door and the body. What I plan to do with the car: - repaint the red parts - the current paint job is ridiculous and I’m not sure I like that it is not metallic. - repaint the calipers - also pretty badly done - reupholster the steering wheel with red stiches and reupholster the ceiling - update all the speakers (some are torn) - get 14” alloys as it came with 15” ones, and my winter tires are 14... Will keep the 15 for the summer - soundproofing - that is a must. Not only for better audio, but also for the rare cases where I need to get it on the highway... It really lacks a 6th gear - refurbish the headlights and get new blinkers - fix the hooks for the rear seats, because, of course, they both tore the moment I tried them - at some point I’ll add rear speakrs and an amp - as mentioned above - LPG system with lightweight bottle. Hi all! So after some years since owning my last polo I am once again a polo owner! Had a 6n 16v as my first car which I loved and spent too much money on. I am sure the build thread is still on here somewhere. Here is a quick picture of it before I sold it Then the urge for more power kicked in so I upgraded to a MK4 Golf GTI which I wish I never sold. Again, spent far to much on this one as well (will see a common theme going on with my cars here) Then came the biggest mistake I ever made, moving away from VW. Brought this money pit of an Astra which had nothing but problems. Brought it as I needed a diesel and it was cheap at the time although now I know why it was cheap! Now as I am moving into london I only need a cheap run around I thought I would get a polo again. This GTI popped up cheap so it was brought this afternoon for £900. Its got just under 100k on the clock and is in great condition. Got a few bits to sort as with any 16 year old car but overall I am very pleased with it Going to try not to spend much on this one but I'm sure that wont last long as usual! engine block and cylinder head messurements AFH/AVY ? Hi lads, I've a 99 polo 1.0 and as everyone I need more grunt. So last week I found something that I couldn't refuse. A 1.6 aee engine "full conversion" add. And for once itlooks like it's full conversion. So I went up to the lad and got: 1.6 aee engine with g40 cams and 1.8 throttle body, G40 box with clutch and fly to match, Driveshafts, exhaust, ecu, wiring loom. Now I need a few questions answered before I start the conversion, as it's my daily and has to be done in a weekend. Will the 1.0 mpi fuel pump feed enough petrol for this big lump? How much different the gear ratios are? (tried searching but couldn't find them, a link would be perfect) Should I get the golf mk2 8v gti injectors? And would they work good? What are the common problems that people find with this conversion? Or is it just straight swap as I'm hoping for? Any help is appreciated. Even links to older conversions. Just need guidance as this has to be done in 48 hours :-D Thanks in advance. Hi there, I know there is a 1.6 ABU crankshaft available for these engines (1.05, 1.3), but is there a 1.8? I know it sounds loony, but I'm basically after loads of torque plus a way to fully utilize a weber DMTL (my 1.3 never really gave it optimum signal). I'll go with the 1.6 if that's the only way, but I don't want to go 16v because I want that hardy/ smooth low-end torque that you get from the 8vs. cheers! Hi guys Am currently doing a conversion on my 6N2. Have got the engine loom (only engine loom, not bay loom). Have also got ecu, key with chips, immobiliser box etc. Just wondering if any of you guys could shed some light on whether I will get away with just replacing the engine loom and ecu? Or perhaps I need the bay loom also? I know the engine loom have some gefty plugs on it that look fairly universal. Cheers guys! Reliability of this re-map on my 1.6tdi 6r, opinions?